Our technical experts, Vadim Deryabin and Nikoo Sabzevar, are shaking up the office. 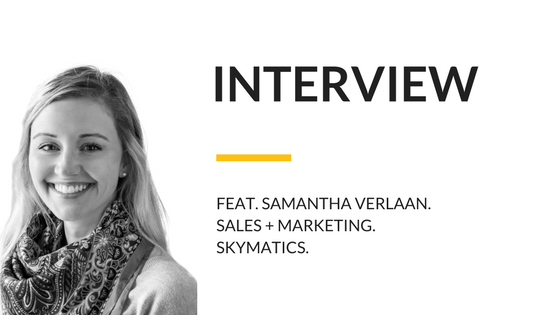 They took over the role of interviewer and placed Samantha Verlaan, our Sales + Marketing Manager in the hot seat. Do you want to start with an introduction? Since this is for people who don’t know you. Who you are and where are you coming from? S: Hi, thanks for coming to my office today (laughs). I am Samantha Malach Verlaan, I am a Canadian citizen, also an American citizen, and I’ve been in Calgary for almost 5 years. Which is longer than I realized. I lived in Regina as a kid, and then went down to Denver with my family, and I went to the University of Colorado at Boulder for my business degree. I worked as a business analyst for a couple of years, and then I got into oil and gas. That’s how I had a Calgary connection as well. I took a break from that industry and did a whole bunch of other stuff that doesn’t have to do with oil and gas or the technology business… and then I came to Skymatics in a Sales + Marketing role. This is a general question about your approach to everything, why do you do something, and how do you do it? S: Oh my goodness, that’s a really good question. I’ve been trying to figure out why I do what I do so that I can make better choices. I do things to make people feel good, happier, and lighter. That’s something I do a LOT of. Which at times can be rather annoying, when people are trying to focus and I’m trying to be entertaining. But I think that it makes the day a little bit nicer. You seem to be a very bright life loving person. So what motivates you to be in this way? S: Well, thank you first of all. I take that as a big compliment. What makes me that way? Well, I have been in dark places before, its part of my history. That was not a great way to be and to live. Luckily I had some really healthy tools to get me out of that headspace and it’s one of the things that I continue to work on. I put a lot of effort into self-care. Making sure that I’m ok, that my family is ok, and that the people that I work with are ok. I like being a part of creating a more positive atmosphere, because that dark place is really dark, and if I can do anything to stay out of it, I certainly will. Was there a wake-up call one day? Or was it gradual? S: It’s happened a few times in my life. The first was when I was in high school. I felt like I wasn’t in control of my world, that there was nothing I could do to make the changes I wanted. I’ve worked through that. It took time and as it does, life changed. That’s the constant, that life is always changing. Of course, I had some difficult personal challenges again, it was a really difficult time for myself and my family. When times are really tough I do whatever I can to make sure that I don’t make the same mistakes again. That can also mean helping other people get through something tough too. What was your first job? And how did you end up here? S: I’ve had 3 first jobs. I’ll explain. The 1st first job was when I was in middle/ high school when I was painting fences, babysitting or cutting lawns. I got my 2nd first job in the US. I was a university student studying marketing and management and was under my parents’ visa, so I couldn’t work. The day that I got my work permit, I went to the mall to find a job and I got hired at Victoria’s Secret that day, I started working within a week. That was my first job where I had to actually pay taxes. My 3rd was when I graduated from the University and started my first career-oriented job. I worked in Denver for a company called Convergys as a Business Analyst in their consulting division, I did that for about 2 years. I ended up here, in Calgary, through my work within the oil and gas industry. My now husband was living in Calgary and I was living in Denver. Because we were working for the same company, lots of work travel allowed us to spend time together. But we had to ask ourselves how do you afford to live in two different cities? It’s expensive. So we had to choose, were we going to live in Calgary or in Denver? He has two kids here, so it’s a no-brainer, we chose Calgary. What exactly do you do at Skymatics? S: Did you guys ever watch the TV show Friends? One of the characters, his name is Chandler, nobody knows what he does. He does spreadsheets or something, but nobody knows what he actually does. What I do here is a multitude of different things. That’s why we have this question here, you do a wide range of things. S: Yeah. What I do, is try to get the message out about the genius that you two (highly technical engineers and programmers) are doing. It could be getting ready to make a video about our SkyClaim offering, or writing a monthly email or the blogs. It’s been a nice stretch for me because I’m not that kind of a writer. For instance, the last blog that we put out, Cassidy, our CTO said, ‘who wrote that?’ I said I did, and he went ‘you wrote that?? ?’ I guess I did a good job, it sounded informed and technical, so that was excellent. Sometimes I’ll take pictures, I almost did a photoshoot of grasses today because we need that for the video. I do a lot of social media, on a daily basis, and also talk to clients, or customers contacting through web traffic or social media chatbots, etc. I’ve been developing our sales methodology. We’ve defined client profiles so that we can reach the right people with a message about the service that they actually need. For instance if I’m introducing you to cars for your children, you’re like, ‘I don’t need cars for my children, they don’t drive, they’re too little’, and if I keep on telling you about cars, you’re just going to shut me out and I’m going to be useless. It’s really important to deliver the right offering to the right person. That’s the marketing part of my job, its fun. If you were not here being an expert at what you’re doing, what would you be doing, and where would you be? S: If I could do whatever I wanted I would empower people and build them up. I’ve seen people transform over and over again, so I know it can be done. I would just cheer people on all day long if I could do anything. That’s what I would do, I’d help people become their best selves. If I had a different job it would probably be doing something with people and relationships because I really like people and I think I do a pretty good job of talking to them. I’m I’m naturally curious about others. I want to know about people and I think people are receptive to that. I’m really fortunate that I get to do those things in my position with Skymatics. It’s ideal. S: I am energized by being around people, but I’m inspired when they do something that surprises themselves. There was one day in the old office where Vadim (brilliant Skymatics programmer) was in a bad mood for 3 days because he had a problem that was really getting the best of him. Some of the office thought we should get him a cake or something to lift his spirits, the problem was really big, a cake wasn’t going to cut it. But when he solved it he leaped out of his chair and did a dance because he was so excited that he’d figured it out! I found that really inspiring. Watching people get through tough challenges and accomplish their goals, that inspires me most. That was a great example. S: It was so fun, such a good memory. I wish more people could have seen it, it was so good. What would you change at Skymatics? S: If I could change something, #1 snacks, because I super like snacks, everybody likes snacks, and I would lift the energy of the whole office. I try to do that sometimes. It’s not always an easy thing. What we’re dealing with is non-emotional, it’s extremely cerebral and as you guys know, you’re the ones doing the magic, it requires focus. The environment needs to support you and your focus. So I know for you guys that’s headsets with… wait do you have music on? Sometimes I’m not listening to anything, it’s just quiet. Or maybe I want to listen to something, but I forget to play it. I wear the headphones, but I forget to play it. It’s there, but nothing’s playing. S: What about you Vadim? For me mostly its music, but sometimes it’s also silence, and sometimes its talk shows. Sometimes I feel like I need to listen to some live people talking. S: I get that, sometimes we have music in the main area so that everyone has sound and something more lively. Sometimes I like it and sometimes I want silence and sometimes I want to listen to what I want to listen to and sometimes I want to listen to a podcast. It’s complicated. It’s hard to create an environment and let it evolve. Everyone has specific needs that change all the time. I suppose I’d also like to continue to build a stronger brand. Because I think that, for whatever reason, that brings people together. We’ve done a lot of digital and some printed materials, but there’s something about having ‘Skymatics’ all over the place and being proud of it, maybe you’re even wearing it. You walk in the door and see it and it starts to create a feeling around the brand and the company. I love that, very cool. Sometimes we can learn about someone by their preferences, what type of movies do you prefer and why? It’s clear that it depends on mood, but what do you think would characterize you. My answer is a little embarrassing, I love musicals. Love them. I went and saw The Greatest Showman and it was like my soul was on fire. Heck yes, dance it up. I totally loved it, I was completely enthralled. There was so much feeling involved and so much talent, just watching those people dance and sing and act, amazing. You can still learn something from a musical, there are lots of emotional lessons to learn in all of that. S: I also like historical fiction. The Crown on Netflix, I know its a movie not a show but, its all about Queen Elizabeth II and her life. I find that so fascinating. Again, to learn about people, where they come from and what their life is like. Because when you understand where somebody has been, you can learn a lot about them, how they see the world and their expectations too. I see it’s all about people. S: It’s all about people. With all the recent controversial news about drones, where do you see the future of drone industry and where would Skymatics be? S: I think that drones are still finding their place. People are testing the use of drones for lots of different things; information sharing, delivery, entertainment, etc. At some point, people will push the limits to a point that the public feels is unsafe. So that’s going to have to get reigned in. There’s a constant sway between too much freedom and too much regulation, we’re all going to have to figure that out. Last summer we saw a drone in the park. You could hear it because they’re quite loud, so in terms of security, at least they’re not silent… that could get people really upset. But we were in a public place and a 12-year-old kid is flying it, he has no idea what the rules are. He doesn’t know that it makes some people uncomfortable and all he’s done is put it in the air and brought it back down. There’s so much that drones can do, but I really think we’re going to have to figure out how society is going to accept the technology. S: I see us in the back end of things. The general public won’t necessarily know about us, they’re not going to see us. The insurance companies, however, they’ll know about us. As we prove the value of SkyClaim for agriculture and crop insurance (that time is coming very soon) our focus will shift to other industries. Whether it’s surveying, engineering, construction, or others, we’ll show our usefulness at a commercial level. But again it won’t be seen, we’ll be behind the scenes. Oooooo, maybe we can make a little sticker that says, powered by Skymatics. It would be our analysis in the background that’s giving information and insights. Great. Is there anything you want to add that we haven’t asked you? S: I changed my mind about one of the answers. S: I think it was about team building, no, it wasn’t about team building, I’M about team building. It was around what I would change at Skymatics. I would do more team building activities. So that we can all continue to understand each other better and learn about each other more, not just in a professional capacity. The professional part is super important, obviously, but when you also have a personal relationship with everybody, it aids in the professional relationship also. I really like it when we have Indian food because then we all share and get to try different dishes. It doesn’t matter what the food is, it’s about spending time together, it’s really important.